This unique spiral two-track board comes as standard with six metal pegs in the color combination of your choice. 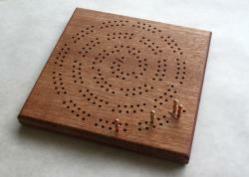 This is a handicap board, otherwise called a cheat board, beginner board or novelty board. One track has 121 holes, the other only 116! That's five fewer holes! NOT FOR TOURNAMENT USE! Perfect though for an experienced player to encourage a new player, or to play a neat trick on a bragging opponent!